As much as 69 percent of the income of six national political parties and 51 regional parties has come from unknown sources, according to a long-term data analysis carried out by the Association for Democratic Reforms (ADR). The total income of these parties between FY 2004-05 and 2014-15 was a whopping Rs 11,367.34 crore. However, their total income from ‘unknown sources’ (that is, income specified in the income-tax returns whose sources are unknown) was Rs 7,832.98 crore or 69 percent. 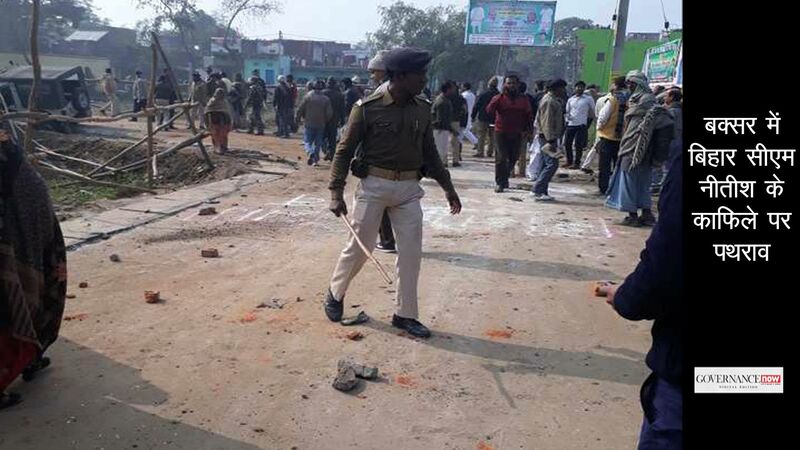 For the Bahujan Samaj party (BSP), all of its income is from unknown sources. 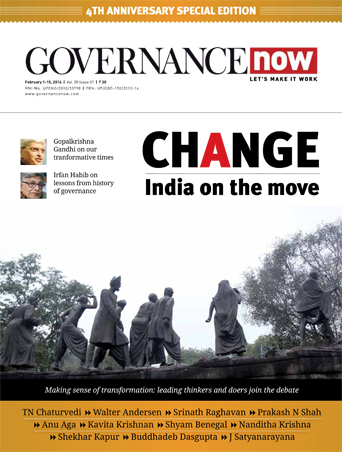 Moreover, these anonymous donors are on the rise: the income of national parties from unknown sources increased by 313 percent, from Rs 274.13 crore during FY 2004-05 to Rs 1,130.92 crore during FY 2014-15. 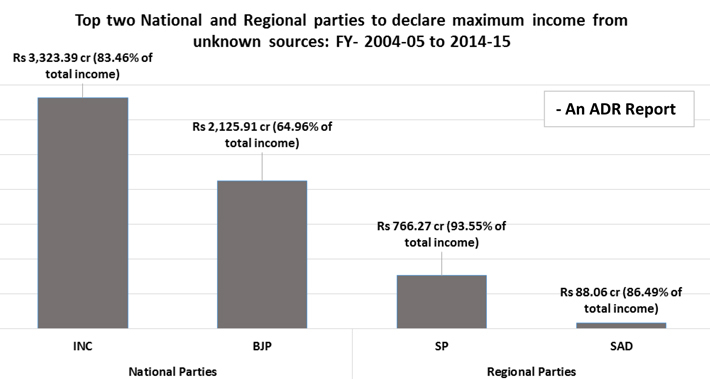 The income of regional parties from unknown sources increased by 652 percent from Rs 37.393 crore during FY 2004-05 to Rs 281.01 cr during FY 2014-15. Their income from known donors (details of donors as available from contribution report submitted by parties to the election commission) was Rs 1,835.63 crore (16 percent) of the total income, while income from other known sources (like sale of assets, membership fees, bank interest, sale of publications, party levy) was Rs 1,698.73 crore (15 percent) of the total. 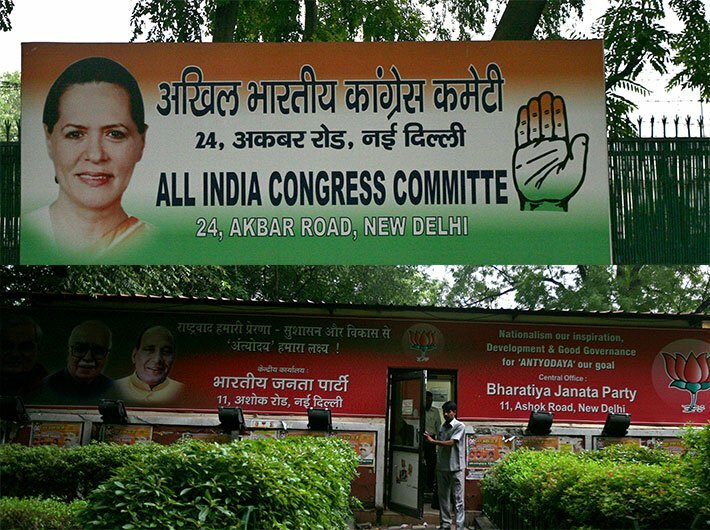 During the 11 years between FY 2004-05 and 2014-15, 83 percent of total income of Congress, amounting to Rs 3,323.39 crore, and 65 percent of total income of BJP, amounting to Rs 2,125.91 crore, came from unknown sources. Among the regional parties, Rs 766.27 crore or 94% of total income of Samajwadi Party and Rs 88.06 crore or 86% of the total income of Shiromani Akali Dal came from unknown sources. The figures are taken from their IT returns and statements filed with the election commission. Political parties are not required to reveal the name of individuals or organisations giving less than Rs 20,000. As a result, over two-thirds of the funds cannot be traced and are from ‘unknown’ sources. “This becomes very relevant in the light of recent events when demonetisation was announced so as to weed out black money from the society,” the ADR said in a statement issued after a press briefing on Tuesday. Of the 51 regional political parties considered for this report, 45 parties have not submitted their donations statements to the ECI for at least one financial year. The 12 regional parties which have never filed their contributions report since FY 2004-05 are: J&K PDP, AJSU, NPP, RSP, MPC, KC-M, SKM, AINRC, PDA, MSCP, HSPDP and PPA. The IT returns/ audit reports of national and regional parties were obtained by filing RTI applications with the IT departments. The IT returns of 42 out of the 51 regional parties analysed were unavailable for at least one financial year. The information was either denied by the IT departments/ the parties had not filed their returns for the financial year/ the departments were unable to trace the audit reports/ incomplete information was provided. Where possible, copies of audit reports were procured from the ECI. 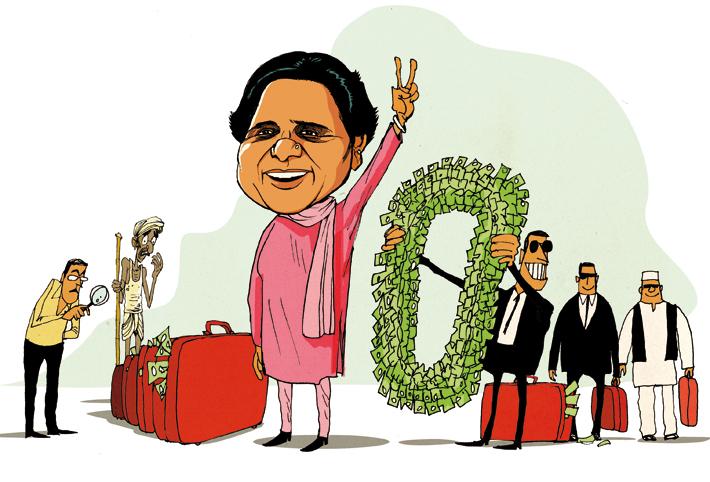 Among all the national and regional parties considered, BSP is the only party to consistently declare receiving NIL donations above Rs 20,000 between FY 2004-05 and 2014-15 thus 100% of the party’s donations came from unknown sources. The total income of the party increased by 2,057% from Rs 5.19 cr during FY 2004-05 to Rs 111.96 cr during FY 2014-15. Since a very large percent of the income of political parties cannot be traced to the original donor, full details of all donors should be made available for public scrutiny under the RTI. Some countries where this is done include Bhutan, Nepal, Germany, France, Italy, Brazil, Bulgaria, the US and Japan. In none of these countries is it possible for almost 75% of the source of funds to be unknown, but at present it is so in India. Any organisation that receives foreign funding should not be allowed to support or campaign for any candidate or political party. Recently, the EC has recommended that tax exemption be awarded only to those political parties which contest and win seats in Lok Sabha/ assembly elections. The commission has also recommended that details of all donors who donate above Rs 2,000 be declared in public domain. ADR supports EC for its strong stand to enforce reforms in funding of political parties and hopes that these reforms are proactively taken up by the government for implementation. The national and other political parties must provide all information under the Right to Information Act. This will only strengthen political parties, elections and democracy.